By the time we reached the labor and delivery floor, I was at that point in contractions where they hurt so mother freaking badly, that there was no relief. I was still reeling from the pain of the previous contraction when the next one hit. The labor and delivery floor was slammed, and the nurse who admitted me was about to leave her shift. She had to stay late because of my surprise arrival, this girl was an angel, I swear. She told me her main concern was making me comfortable, and she moved mountains to get the anesthesiologist there asap to stick that wonderful needle into my spine. I had absolutely no qualms about receiving an epidural. 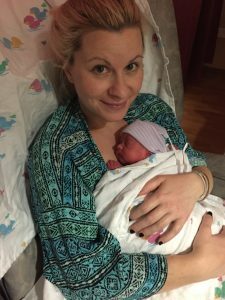 My baby B was breech, and there was a possibility that I would need an emergency C-section between babies. Before giving me the epidural, they checked my cervix again. I wanted to refuse the cervical check because they are awful, but the resident doctor convinced me otherwise. They had been in contact with my doctor, who was across the street at his office, but he wasn’t on his way yet. They wanted to make sure I wasn’t too far along so that he had time to get there. I had progressed even more, to 5 cm, but still had awhile to go. They placed the epidural, and as my contractions started to calm down, Ben went upstairs to my room to ‘get something,’ which is code for pooping (sorry babe!). I had the urge to pee, so I informed my nurse. She checked my cervix AGAIN to make sure that I wasn’t close too close to being fully dilated. I didn’t care at this point. I had to pee so badly I thought I was going to explode. She checked my cervix as the pressure continued, and immediately started yelling for the other nurses to find Ben on the third floor. “She’s dilated to a ten and there’s a head! These babies are coming NOW!” she shouted. As she shouted all these orders, I felt the pain of my contractions start to increase again. Apparently, it hadn’t been enough time for the epidural to start working. The pressure on my pelvis increased to a pain that can only be described an elephant stomping around with knives. I needed to get these babies out of me asap. They careened me down the hall at 100 miles per hour towards the operating room. Twin births are required to take place on an operating table since there is an increased risk of C-section. Even if both babies are head down, baby B can flip once baby A is born, increasing the risk of becoming caught in the umbilical cord. I had heard stories from enough twin moms that I was perfectly fine with this situation, plus, these babies were literally clawing their way out; I didn’t care where I had them. As we arrived at the operating room, I saw Ben, looking absolutely panicked, changing into scrubs. I was screaming and begging them to get the babies out when I saw my doctor running down the hall. “It’s OK Caitlin, we’re going to do this, these babies want to come today, and we’re going to get them out! You just keep breathing and do exactly as I say!” It took about 6 nurses to somehow move my whale-like self from the bed onto the operating table. I was crying and shaking the entire time and absolutely no help to them. There were what seemed like 20 doctors and nurses in the room with us. There was my doctor, plus two other obgyn’s, three or four labor and delivery nurses; one doctor from NICU, and three or four NICU nurses. My doctor performed an ultrasound at 7:03 to determine that baby A was still head down. I was in so much pain that I couldn’t function. The nurses were telling me to push, and I wanted to scream that I couldn’t. Two minutes later (the most excruciating two minutes of my life), Josephine Catherine was born. Once Josie came out, and I felt a wave of relief wash over me. 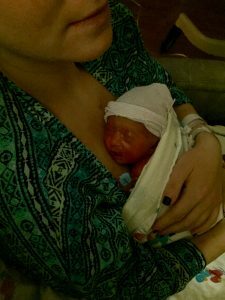 The pressure was gone, there was a pause in contractions, and I watched the doctor examine my baby girl. 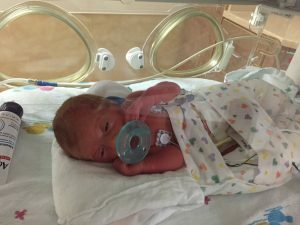 Josie was a tiny little fighter at 3 pounds, 9 ounces. She was breathing on her own but needed to be taken to NICU right away. They brought her over to me so that I could give her a quick kiss, which I don’t even remember because my doctor determined that Margo was still transverse, and was in the process of manually flipping her. My doctor pushed on my stomach and flipped Margo so that she was head down. I’m not sure how I did it, but Margo Jean was born at 7:13, 8 minutes after Josephine. 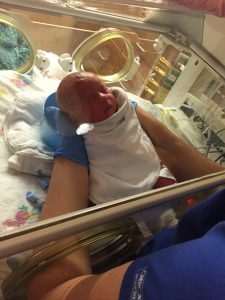 She weighed 4 pounds, 6 ounces, and was also breathing on her own. The steroid shot that I was given to help their lung development must have worked! I was able to give her a kiss, and then she was rushed off to NICU with her sister. Ben followed the babies to NICU while they delivered the placentas and stitched me up. After a little while, we went back upstairs to my room (the one I had been living in), still in shock. The nurses all greeted me with warm congratulations. I guess one perk of being on bedrest was that I already knew all of the nurses. It was almost like seeing my friends! They asked about my pain level, and if I needed an ice pack, and honestly… I felt fine. With Theo, I feel as if I used ice packs for a full month, but this time, I felt almost normal. I’m not sure if it was because it was my second delivery, or because the actual experience was so painful that it was just a relief not to be feeling it anymore, but regardless, I was ready to go downstairs to NICU to meet my babies. Margo just four hours old. My first time holding Margo! My first time holding Josie. She was so tiny. The first time I got to hold my girls together when they were 5 days old! Seeing my baby girls in NICU was a very surreal experience. It’s not an experience I would wish on any family. I am so thankful that they came home healthy and strong, but I can’t help but feel as if I was robbed of the birth experience. I didn’t get to hold my babies after they were born; we didn’t get to take a family picture with Theo and the girls all snuggled up in the hospital bed, and I had to leave the hospital without my babies. Shortly after they came home, Theo and I watched a Daniel Tiger episode that brought me to tears. It was the episode when Daniel’s baby sister was born. Daniel went to the hospital to meet her and they all went home together. As tears streamed down my face during a cartoon show, I realized that my bedrest and NICU experience had affected me much more than I thought it had. I had been focusing on staying strong and getting the babies home, and I didn’t leave time to process any emotions. Thankfully, Daniel Tiger helped me figure it out.